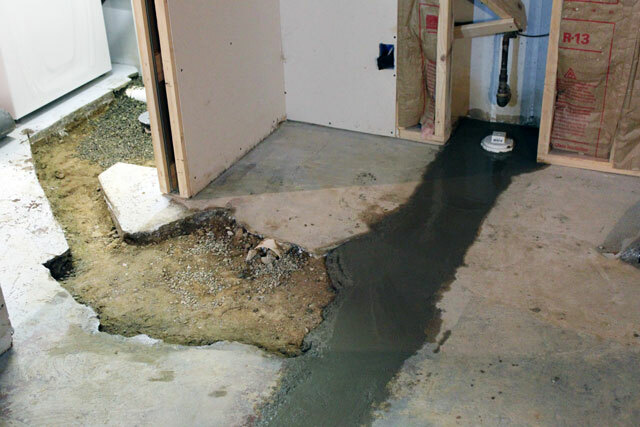 It's like we never cut up the basement floor at all. Except there is a layer of dust on everything. Just when I clean one room, things from a dirty room get moved in and I have to clean everything again! 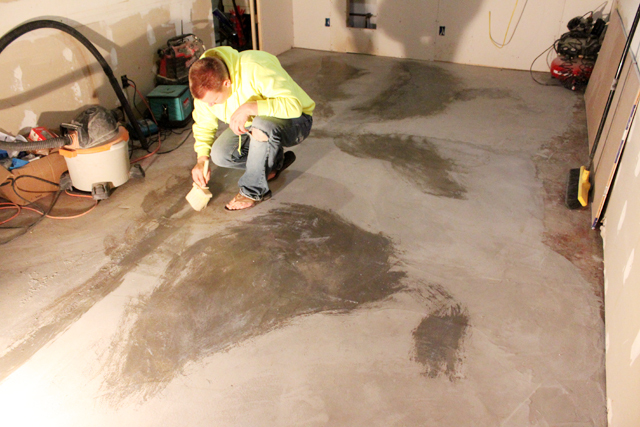 After it was cleaned, Mike wasted no time filling it with concrete. This picture is blurry, (you know by now that Mike doesn't pose for me and I'm left with blurry action shots), but I added it so that you can see the set up. Just a man in his pajamas, with a wheel barrel and a purple bucket. I offered to help, (actually I offered to trade my labor to the neighbors to help them paint in exchange for the husband to come over to help Mike), but Mike said it was actually easier to do with just one man because he could work at his pace and control the amount of concrete so that he didn't make too much or too little. He ended up completing it in one evening, just making one bag at a time and dumping it in the trench, then troweling it out for a smooth finish. 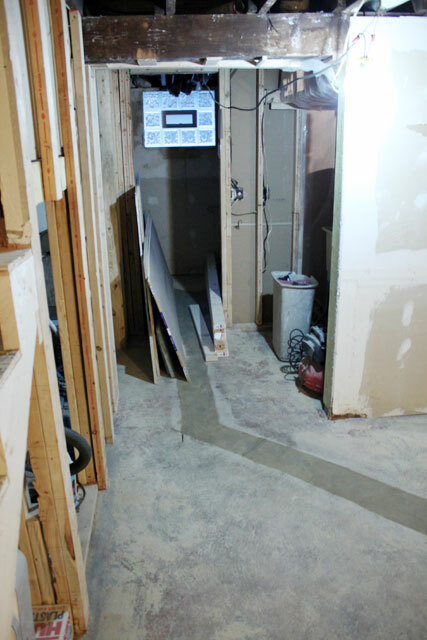 A couple photos up you can see all the bags of concrete Mike bought, (then had to haul downstairs). He estimated 20 bags and only needed 10. He's usually closer than that, but he estimated a uniform depth throughout the entire trench, but some spots were deeper and most were more shallow. We took the rest back for a refund, but the total for all 20 bags was only about $60, so for a $30 refund Mike had to carry a couple hundred pounds of concrete mix back upstairs. After he was done he might have made a comment that $30 wasn't worth it. Then he rested and came back to his frugal senses. 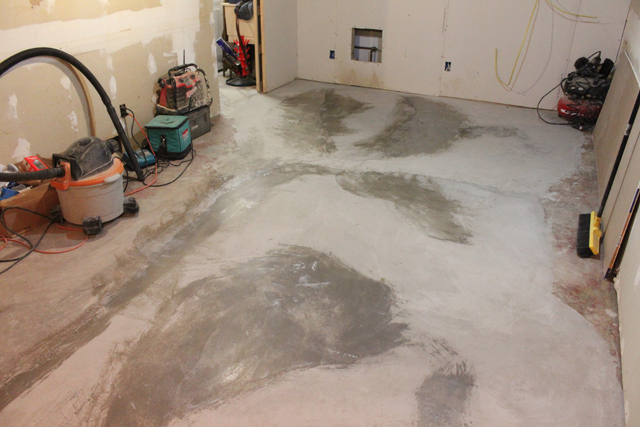 We've been mostly living away from the basement since we've started, so it wasn't that hard to stay away for a couple days to allow the concrete to cure enough to walk around on. 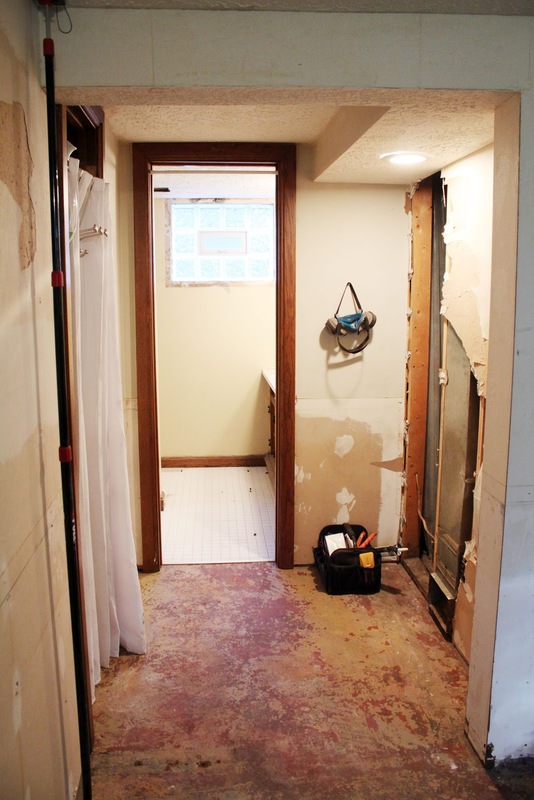 We've even started storing stuff on it, like here in the bathroom, while we prep for the leveling. 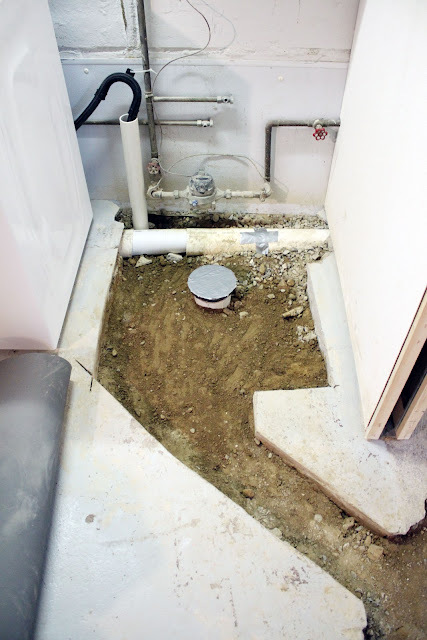 Before the patch in the laundry room harden too much, Mike placed the utility sink where he wanted it and pushed it in. 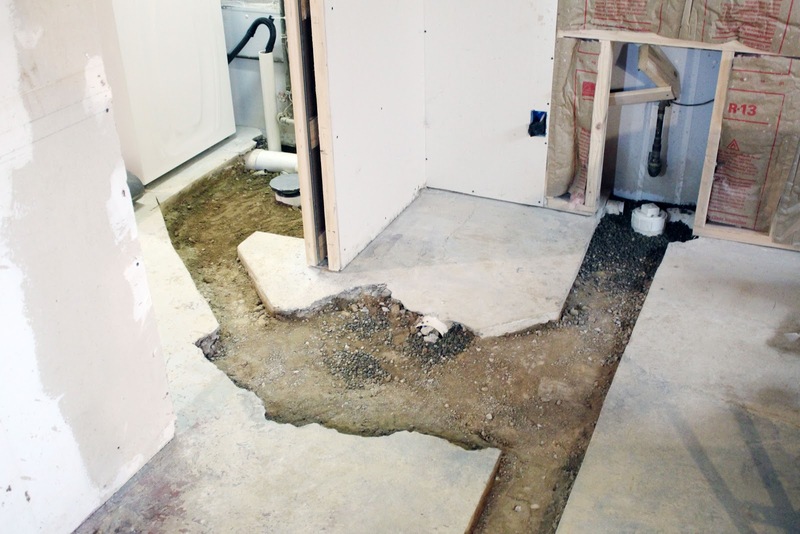 Since the floor was so uneven, we've lived with the sink rocking back and forth. Now it's not going anywhere. 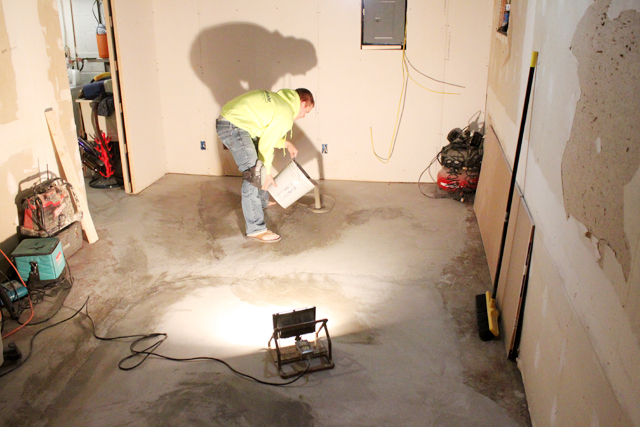 The other night Mike and I actually went down and measured the floor and created a little topography map in order to estimate how much self-leveling concrete we need to level the floor. We've actually determined it's not as bad as we originally thought. 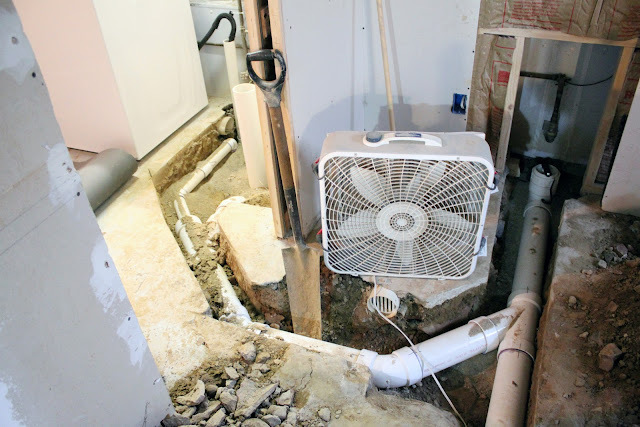 Only about a 7' x 7' area is really bad, (the room slopes down at the cleanout plug) and we've been going back and forth about the best option to handle the leveling. It's a really expensive process and we're hoping we do it right. We've actually got some manpower coming to help this weekend, so I'm hoping they knock it out and we're able to lay our laminate flooring (which we've already ordered and will be picked up soon), in the next week or so! As I mentioned last time, Mike promised, (or threatened?) 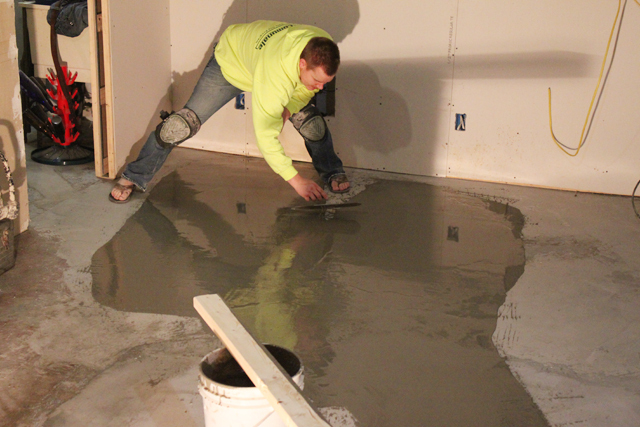 to cut the basement floor up over the long weekend. 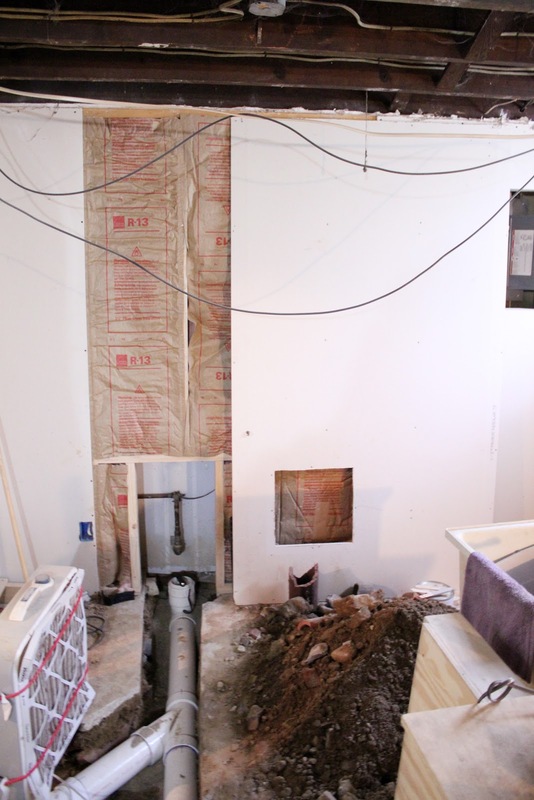 I knew it wasn't going to be pretty, but boy did I underestimate the general dirtiness that would ensue. First I have to say I got sick this weekend. Mike says it was because I went Black Friday Shopping (for the first time, my opinion - eh, my sister got some good deals and I was along for the ride), but the weather turned and everyone I work with is sick as well, so it could have been a lot of things. The moral of the story is that I pretty much slept all weekend. While poor Mike was literally knee deep in dirt and sewage pipe. That's why I love that guy. 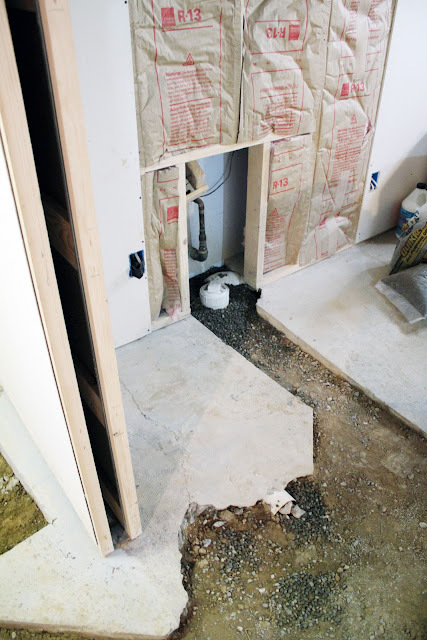 The weekend started on Saturday morning after I woke up to gas fumes and loud saw cutting. 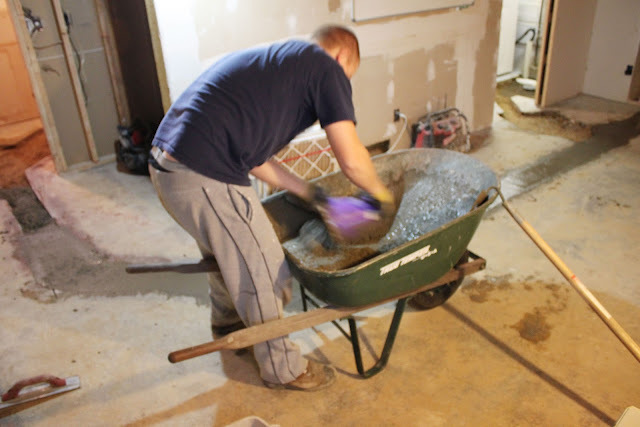 We borrowed both a gas-powered and electric partner saw to cut the concrete and even with a lot of friends commenting that the gas-powered was going to create a lot of fumes, Mike had to try it. He said he used it to cut maybe a 12 inch section of concrete. The house smelled for about 6 hours. 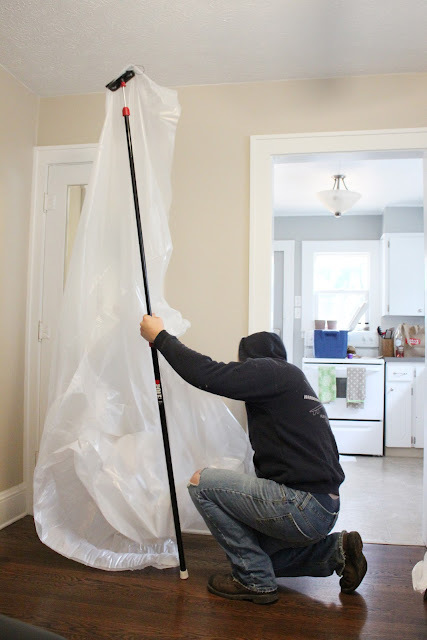 I could have handled the gas fumes, (I stayed upstairs and opened a window), and the massive amounts of dust that created a cloud on the first floor, but what eventually made me leave was the no water usage rule. 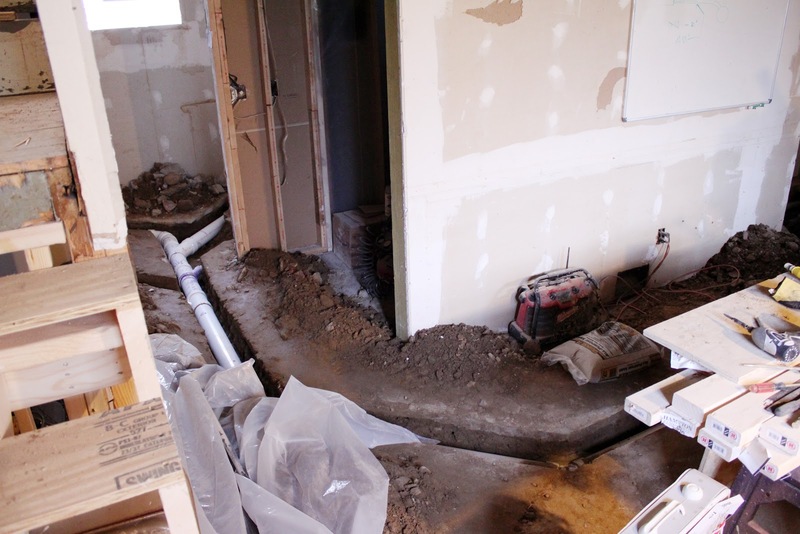 Mike was working on all the drainage pipes so while he kept the water on, it didn't have anywhere to go. 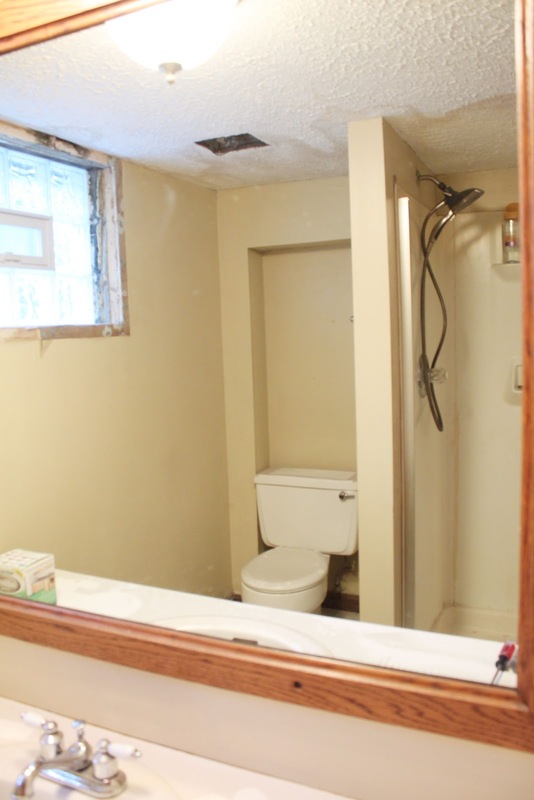 Obviously that included the toilets as well. Benelli and I lasted about an hour and then went to my dad's house, who was conveniently out of town for the weekend, (deer season - need I say more). I didn't do much more than sleep and blow my nose, while Benelli slept and did perimeter checks of the new place. 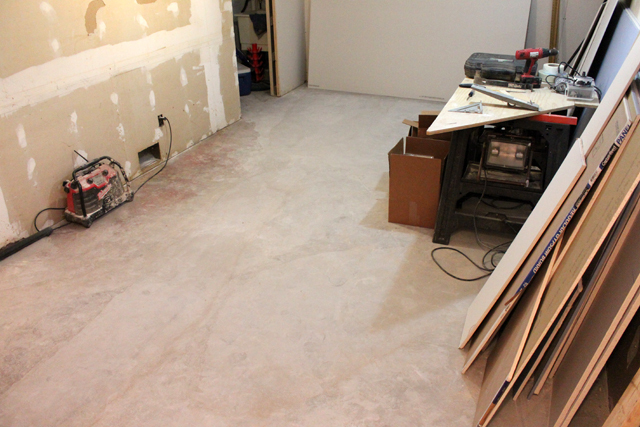 But, the dust still made it's way upstairs and coated everything. 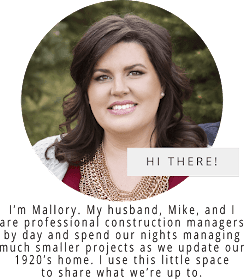 I tried explaining the cloud that I had to hold my breath through to Mike, but he couldn't understand since he was wetting everything down as he was cutting, but that dust is tricky. After the cutting was done, Mike was left with the hard part. 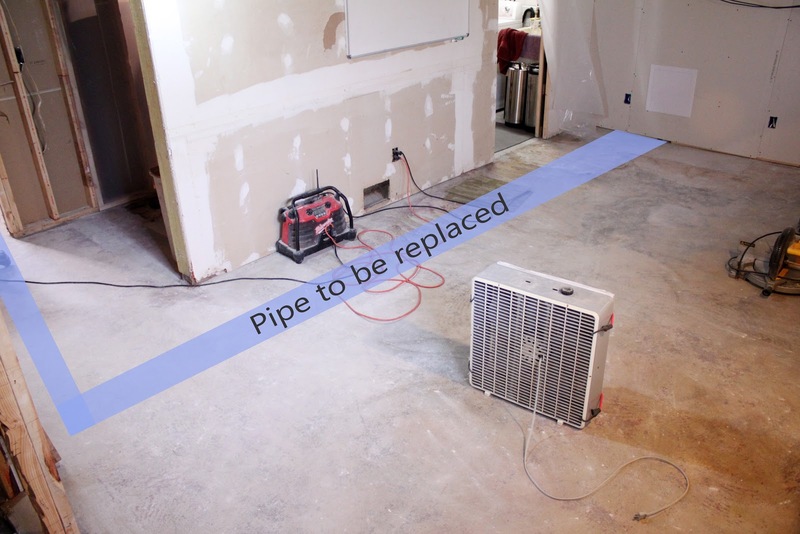 While the first picture shows the general area he thought the old pipe was, he was wrong. 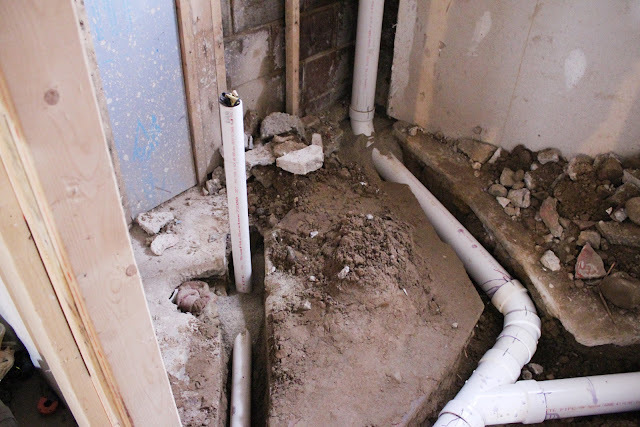 The pipe went under walls and through different rooms, but this didn't really matter in the long run because we realized we didn't have to remove all the old pipe, just the parts that we needed to tie into, and anything that was in the way of the new pipe path. 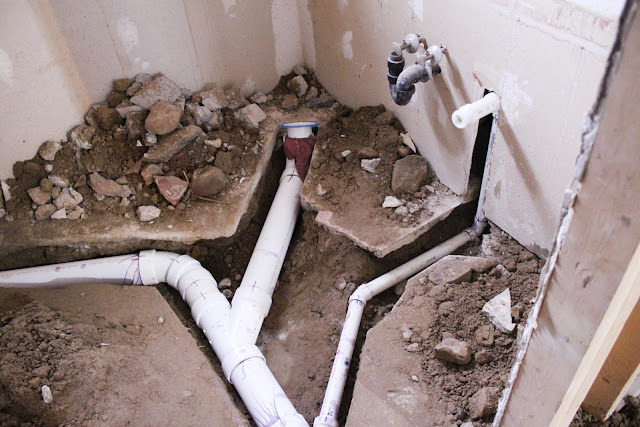 He thought it would be simple to dig out the dirt to place the new pipe, but the ground was hard packed clay with large, (2"-4") rocks. And, he hand dug out the whole trench. The reason this post is so wordy is because I obviously wasn't there to take pictures along the way. I came back the next day after Mike was done with the tie-ins and the okay was given to use the water again. I only have pictures of the aftermath. 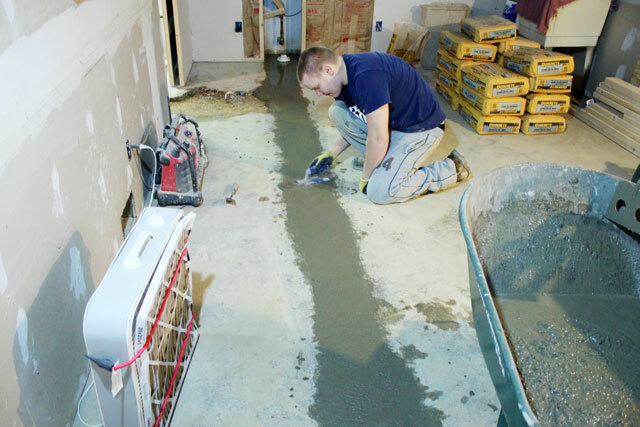 As you can see, Mike cut the concrete, which is a couple inches thick, hand dug out the dirt, (which is piled along the trench), cutting out any of the existing pipe along the way and then installed shiny new PVC piping. 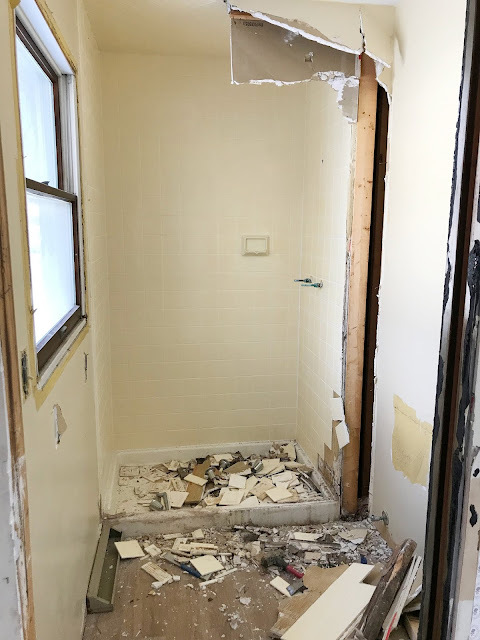 To show you all he did, we'll start in the bathroom. Remember when this was considered clean? 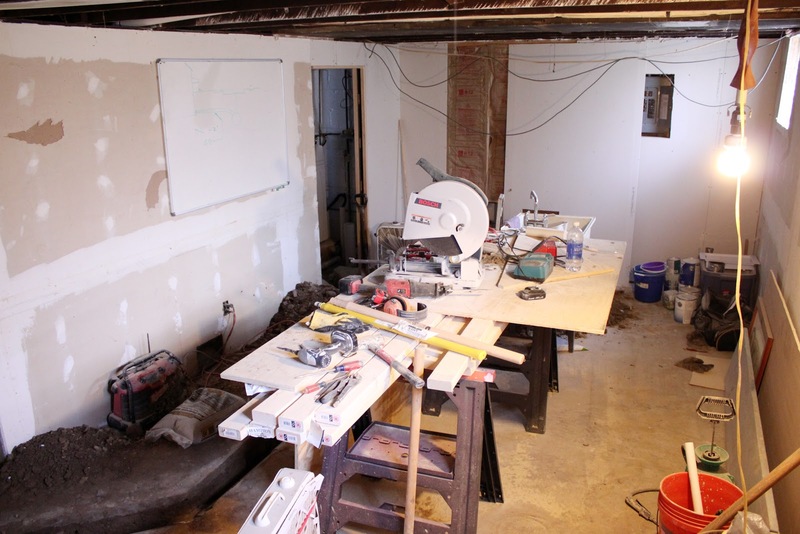 Mike had to install a lot in this room. Makes us feel silly for complaining about having to take out the flooring like the upstairs bathroom. Instead, mike cut out a branch-like design for all the new pipe for the shower, toilet, sink and replacing the vent stack. 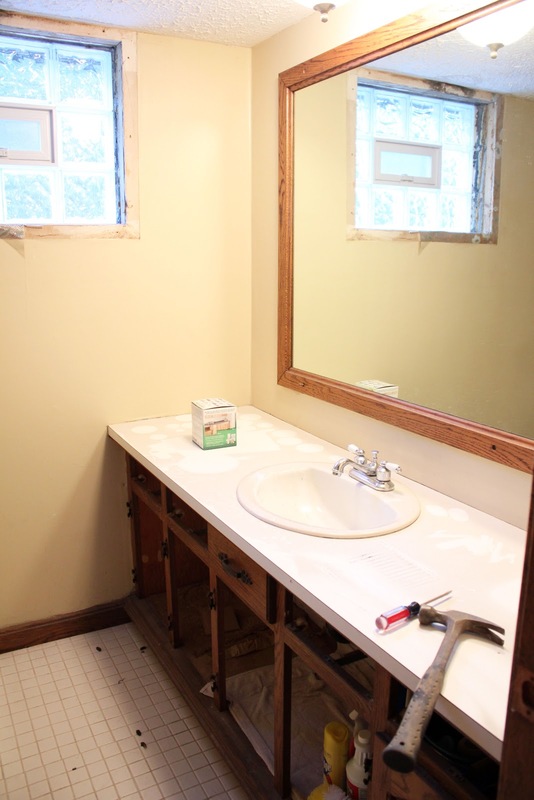 To the right is the new placement for the toilet and the vanity. 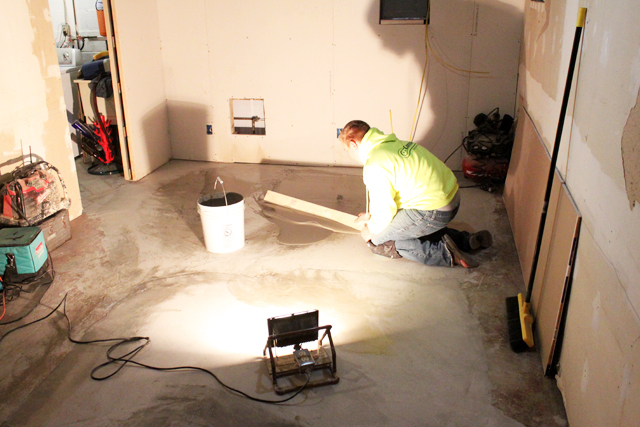 After the flooring is patched back up and leveled, the water lines will get moved as well. 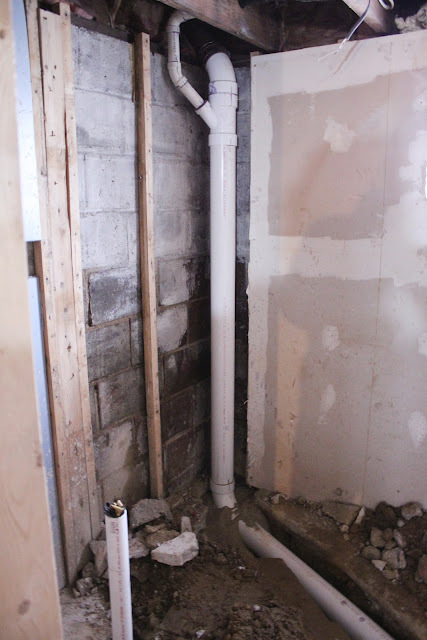 To the left, the old clay vent stack was replaced with PVC and the new shower drain was put it. 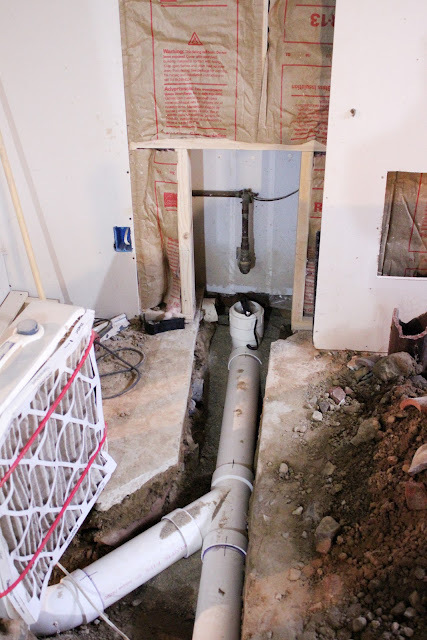 We plan to buy a 48" shower base, (which will seem giant compared to the 36" we had before), therefore the drain pipe had to be centered to the new size. Since we replaced the vent stack when we renovated the bathroom upstairs, I haven't specifically asked Mike about his plans for the middle section which sits behind the kitchen walls. 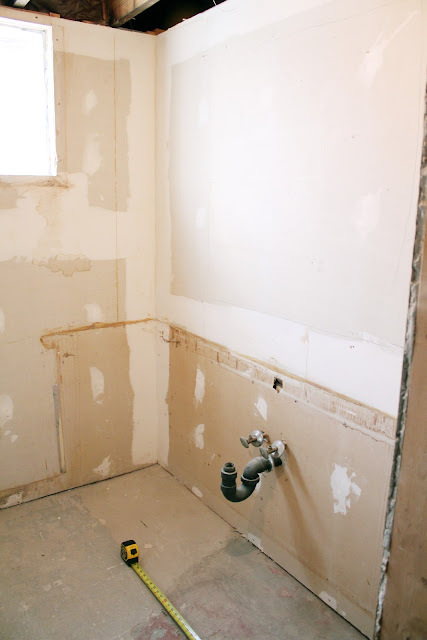 I'm assuming when the kitchen demo starts, (which could be next week for all I know seeing as how we plan a project then usually get antsy and start months before we plan to), he'll replace that cast iron section as well and we'll have all new PVC. Moving out of the bathroom into the future family room, it's a little more straight forward with the main pipe traveling through the room to the new clean out valve Mike installed. 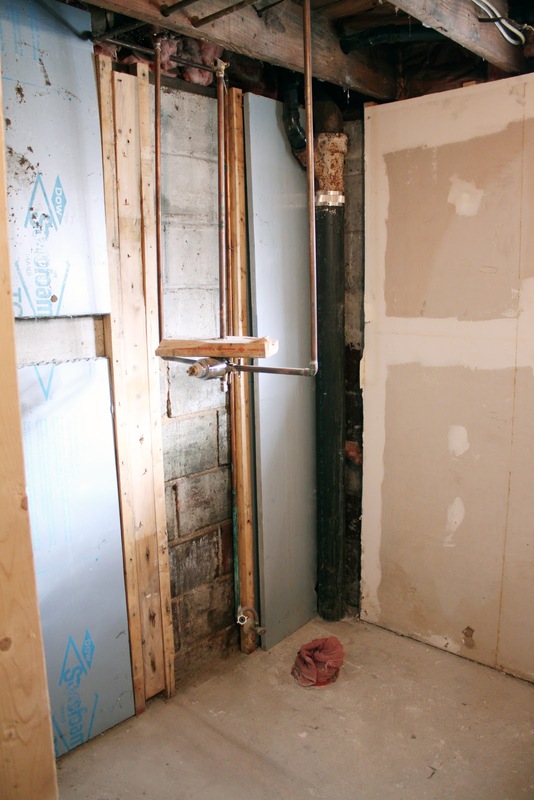 The one thing that required extra attention was the slop required for the piping. We definitely don't want anything that comes down the drain to stop anywhere because it hits a spot that's level! 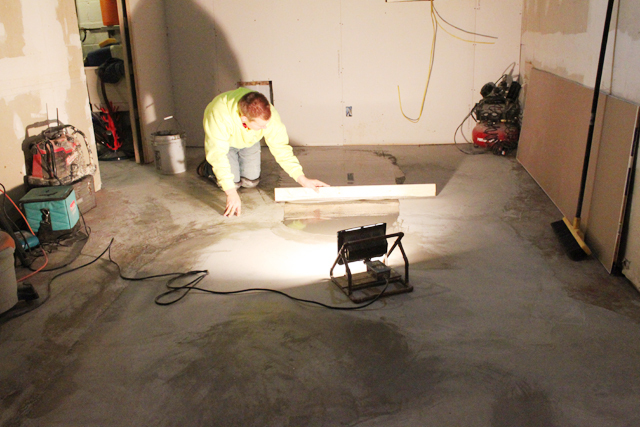 Mike maintained a 1/8" slop by using sand under the joints to support them when he pours the concrete. 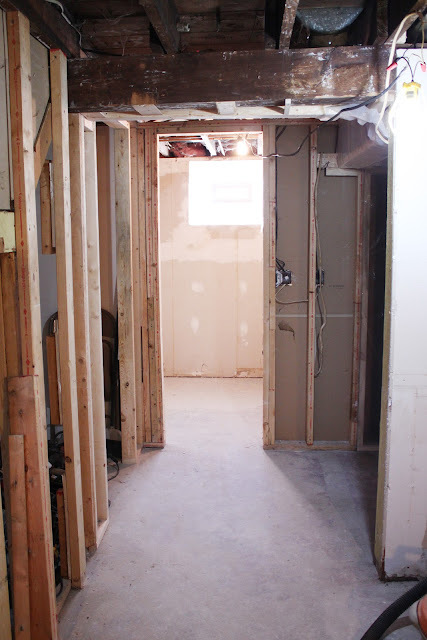 Since Mike had already framed and drywalled this years ago when we took out the old paneling when we moved in, you can see when I zoom out that he just unscrewed the whole sheet and put it off to the side to have access into the wall. That's why he's in charge of the heavy stuff, my idea was to cut out a bigger whole and patch it, I blame the cold for the brain fart. 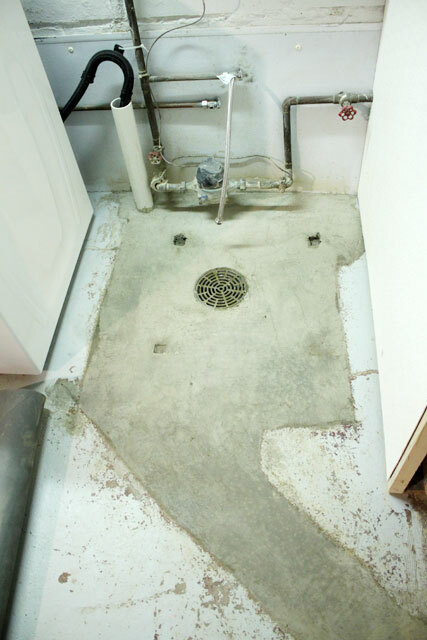 The other spot that got the PVC treatment was the laundry room where the utility sink sits. There's an old floor drain that tied into the main pipe and wasn't very big. It sometimes overflowed and before we bought our high efficiency washer, would always fill up with soap suds. Benelli could always be found sitting in front of the suds watching them come out on laundry days. 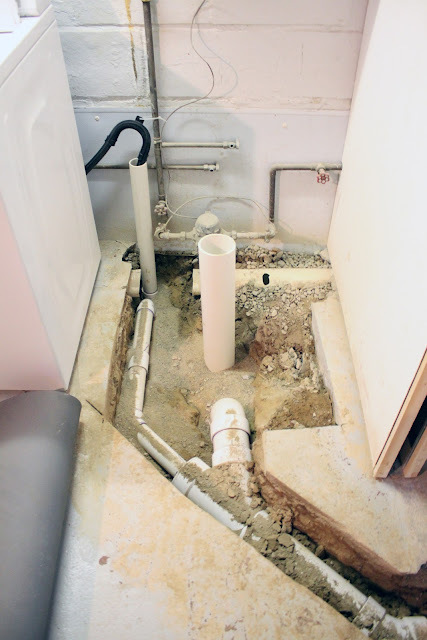 To help/prevent this he added a drain pipe for the washer to bypass the floor drain. See that cut pipe with the slotted cap, well that's part of the "waterproofing system" the previous owner had installed. Our neighbors said that our basement used to have a really bad water problem before we moved in. 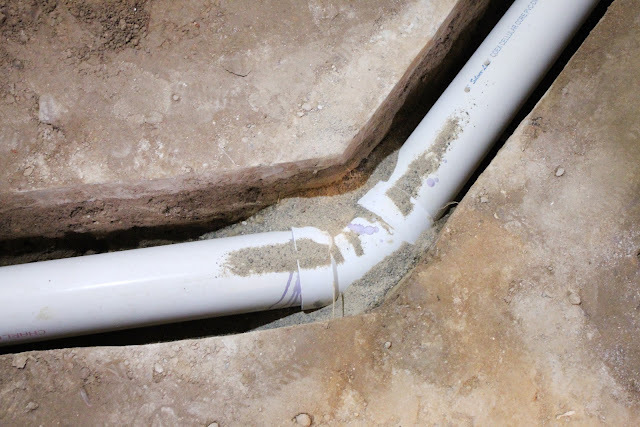 We never gave water a chance to cause any problems by tying all the downspouts drains and sump pump drains into one underground drain that went to a dry well we built when we excavated for the garage. 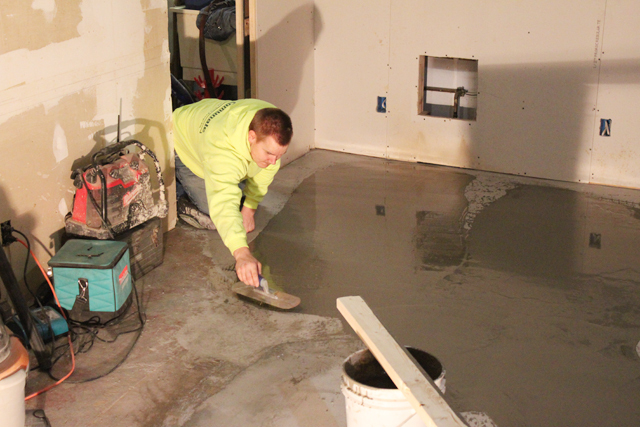 We also replaced that concrete that was sloping toward the house with a new slab. We've never had a water problem, (and we've definitely had some flooding conditions), but it's a good thing because this stupid pipe wouldn't have helped at all! 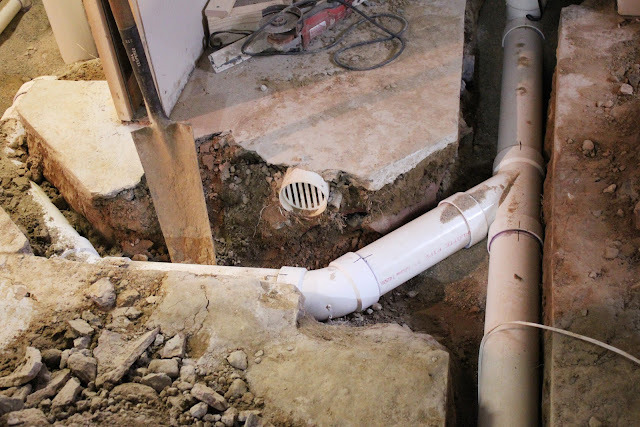 You can't see from the picture, but the perforations in the pipe face down, which isn't really helpful in hard compacted clay. It should have been installed with stone around it. So, essentially, the pipe is useless. That's good because as you can see, they didn't even dig that deep and there's less than a half an inch of concrete on top. Mike said in one spot, they actually heated the pipe to deform it a little so they didn't have to dig any deeper. 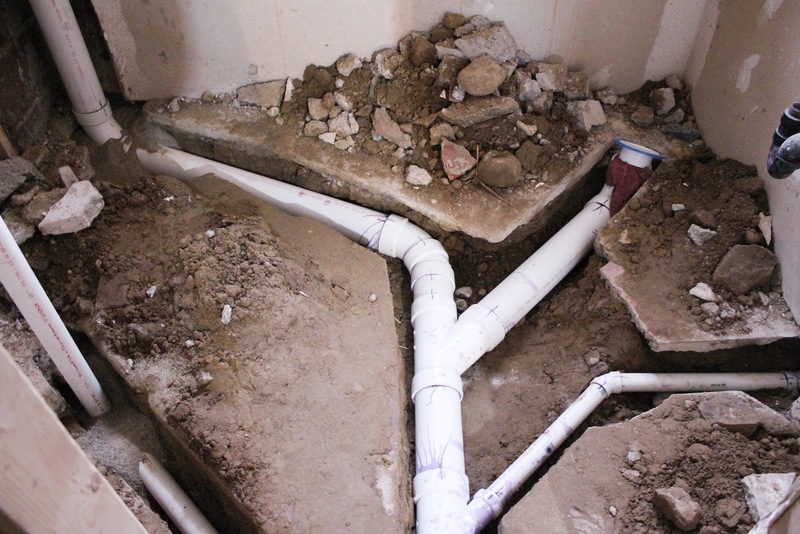 All that needed was one heavy piece of furniture to land in the right spot to crack the concrete and pipe. Agh! Mike wants to look in our records to see if the previous owner left the name of the company who did it to give them a piece of his mind. He may not have to bother since they're probably out of business doing shoddy work like that. 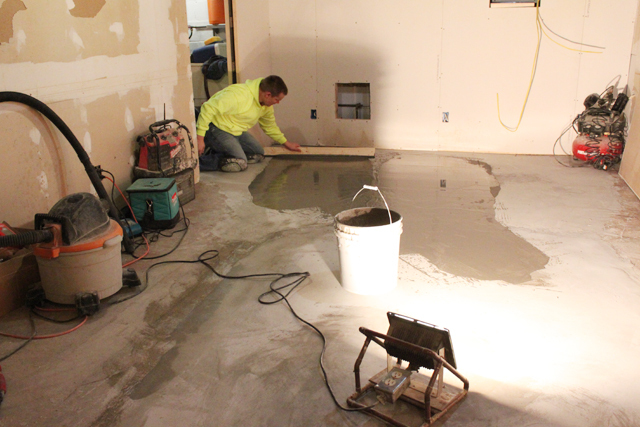 We don't have to worry too much about it anymore since we'll be adding more concrete when we re-level everything next. Mike just gets annoyed when people take shortcuts. Even with all the dirt, there was one good thing that came out of the weekend. 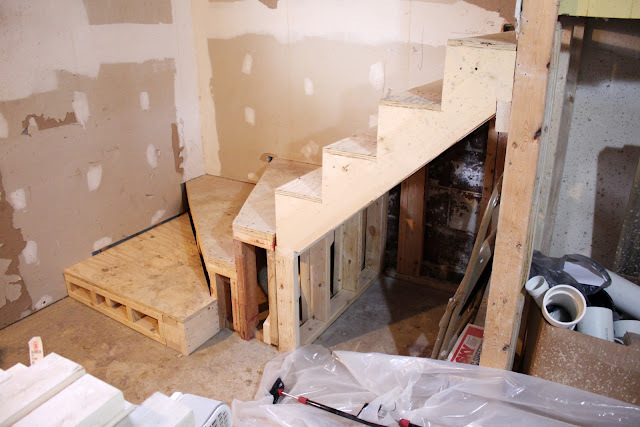 Mike definitely didn't want to walk up and down the ladder/stairs the whole weekend, so he built the rest of the stairs and covered them with plywood. 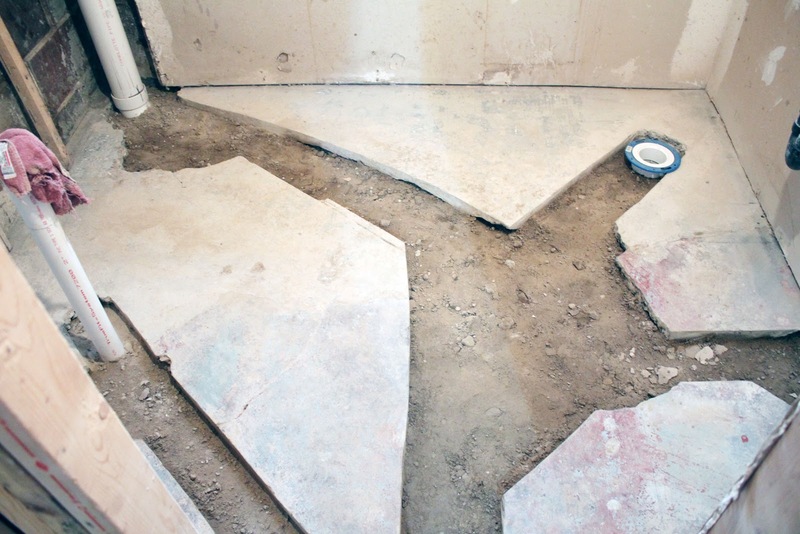 He even built out the bottom step so that when it's complete it looks and flows a little better into the room. 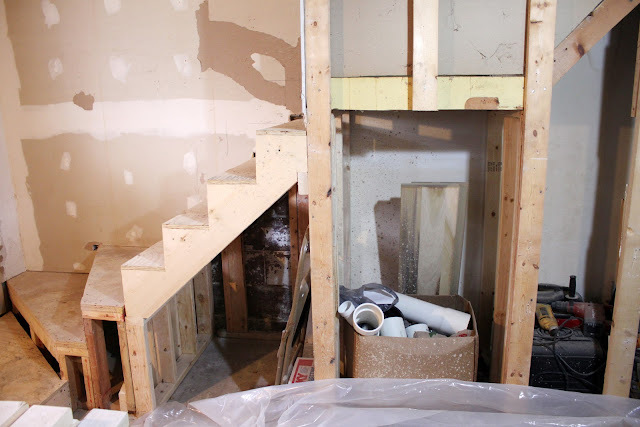 As you can see from the bottom step framing, the floor is significantly uneven throughout the entire room. 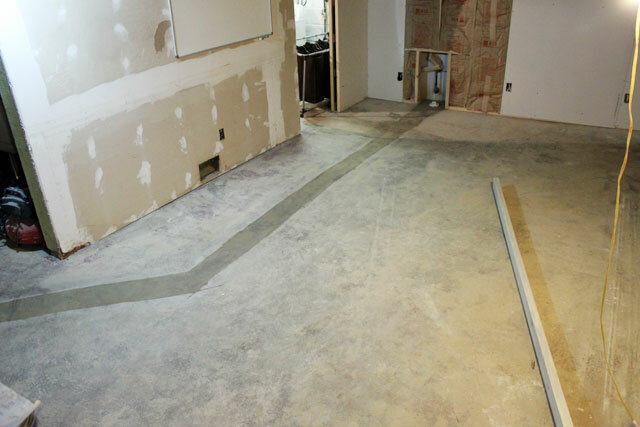 The next step to this project is filling in the spots that Mike cut to replace the pipes, and then after that has cured, re-leveling the floor so that we have a flat surface to install our flooring. 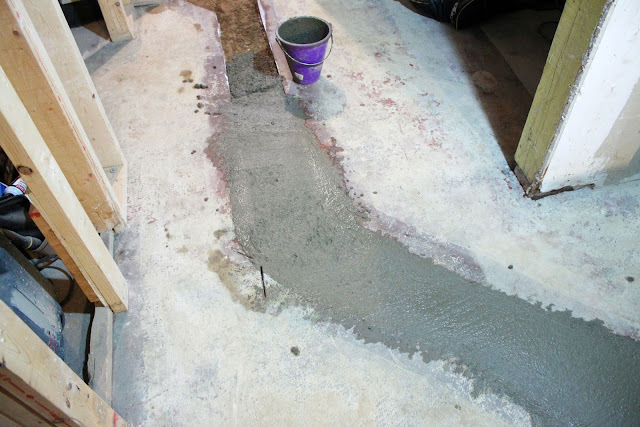 Some might ask why the filling and leveling can't be done in one step, but concrete comes in many different types, (or in industry terms, mix designs), and the type of concrete used to get the required strength of the patches Mike cut out is different than the low viscosity, self-leveling concrete used to level the floor. And, you thought all I did was take the pretty pictures!